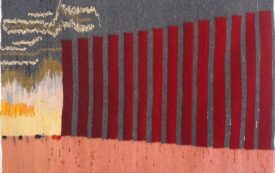 Elizabeth Starcevic has been weaving large wall hangings in Mexico for over 25 years. As a professor of Spanish literature and language at City College of New York (now retired), Elizabeth Starcevic fought for Open Admissions, day care, student and faculty rights and worked actively in the union for over 40 years. She learned to weave in Mexico and has had shows in Bellas Artes and in museums and galleries in San Miguel de Allende and Xalapa. She has shown in galleries and a variety of venues in NYC, New Jersey, and Vancouver. Although weaving is a “slow” art, it has been impossible not to respond to the upsurge of violence and insecurity that were unleashed during the presidential campaign of 2016. More of her work can be seen here. What will be the real cost of building a wall, in money and lives?